Bonne of Luxemburg or Jutta of Luxemburg (20 May 1315 – 11 September 1349), was born Jutta (Judith), the second daughter of John the Blind, king of Bohemia, and his first wife, Elisabeth of Bohemia. She was the first wife of King John II of France; however, as she died a year prior to his accession, she was never a French queen. Jutta was referred to in French historiography as Bonne de Luxembourg. She was a member of the House of Luxembourg. Among her children were Charles V of France, Philip II, Duke of Burgundy, and Joan, Queen of Navarre. In 1326, Jutta was originally betrothed to Henry of Bar; however this arrangement was broken and she stayed at the abbey of Saint-Esprit until her marriage to John, Duke of Normandy. The family of King John. Jutta was married to John, Duke of Normandy on 28 July 1332 at the church of Notre-Dame in Melun. She was 17 years old, and the future king was 13. Her name Jutta (or Guta), translatable into English as Good (in the feminine case), was changed by the time of her marriage to Bonne (French) or Bona (Latin). Upon marriage, Bonne was the wife of the heir to the French throne, becoming Duchess of Normandy, and Countess of Anjou and of Maine. The wedding was celebrated in the presence of six thousand guests. The festivities were prolonged by a further two months when the young groom was finally knighted at the cathedral of Notre-Dame in Paris. 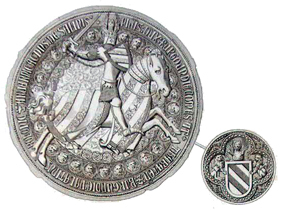 John was solemnly granted the arms of a knight in front of a prestigious audience bringing together the kings of Bohemia and Navarre, and the dukes of Burgundy, Lorraine and the Brabant. 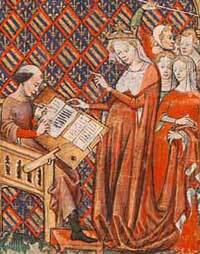 Bonne was a patron of the arts, the composer Guillaume de Machaut being one of her favorites. She died on 11 September 1349 of the bubonic plague in Maubisson, France at the age of thirty-four. She was buried in the Abbey of Maubuisson. Less than six months after Bonne's death, John married Joan I, Countess of Auvergne. Wikimedia Commons has media related to Bonne of Luxembourg. ^ a b Nicolle 2004, p. 17. ^ a b c Boehm & Fajt 2005, p. xvi. ^ a b Hand 2013, p. 12. ^ Robertson 2002, p. 3. ^ Perrot & Reinach 1907, p. 448-449. ^ a b c d'Arras 2012, p. 234. ^ Vaughan 2005, p. 152.
d'Arras, Jean (2012). Melusine;or The Noble History of Lusignan. Translated by Maddox, Donald; Sturm-Maddox, Sara. The Pennsylvania State University Press. Boehm, Barbara Drake; Fajt, Jiri, eds. (2005). Prague: The Crown of Bohemia, 1347-1437. Yale University Press. Hand, Joni M. (2013). Women, Manuscripts and Identity in Northern Europe, 1350-1550. Ashgate Publishing. Nicolle, David (2004). Poitiers 1356: The Capture of a King. Osprey. Perrot, G.; Reinach, S., eds. (1907). Revue archéologique Juillet-Decembre 1907 (in French). Vol. 4-Vol. 9. Ernest Leroux. Robertson, Anne Walters (2002). Guillaume de Machaut and Reims. Cambridge University Press. Vaughan, Richard (2005). Philip the Bold: The Formation of the Burgundian State. The Boydell Press. 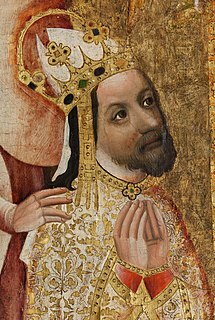 Charles IV, born Wenceslaus, was the first King of Bohemia to become Holy Roman Emperor. He was a member of the House of Luxembourg from his father's side and the Czech House of Přemyslid from his mother's side; he emphasized the latter due to his lifelong affinity for the Czech side of his inheritance, and also because his direct ancestors in the Přemyslid line included two saints. Philip the Bold was Duke of Burgundy and jure uxoris Count of Flanders, Artois and Burgundy. The fourth and youngest son of King John II of France and his wife, Bonne of Luxembourg, Philip was the founder of the Burgundian branch of the House of Valois. His vast collection of territories made him the undisputed premier peer of the kingdom of France and made his successors formidable subjects, and sometimes rivals, of the kings of France. John II, called John the Good, was King of France from 1350 until his death. He was the second monarch from the House of Valois. Philip of Burgundy was Count of Auvergne and Boulogne in right of his wife and was the only son and heir of Odo IV, Duke of Burgundy, and of Joan III, Countess of Burgundy. His mother was the daughter of King Philip V of France and of Joan II, Countess of Burgundy. Philip of Rouvres was the Count of Burgundy and Count of Artois from 1347, Duke of Burgundy from 1349, and Count of Auvergne and Boulogne from 1360. He was the only son of Philip, heir to the Duchy of Burgundy, and Joan I, heiress of Auvergne and Boulogne. Louis I, called the Lame was Count of Clermont-en-Beauvaisis and La Marche and the first Duke of Bourbon. John of Berry or John the Magnificent was Duke of Berry and Auvergne and Count of Poitiers and Montpensier. He was the third son of King John II of France and Bonne of Luxemburg; his brothers were King Charles V of France, Duke Louis I of Anjou and Duke Philip the Bold of Burgundy. He is primarily remembered as a collector of the important illuminated manuscripts and other works of art commissioned by him, such as the Très Riches Heures. Margaret III was the last Countess of Flanders of the House of Dampierre, as well as Countess of Artois and Countess of Burgundy. She was the only surviving child and heir of Louis II, Count of Flanders (1346–1384) and Margaret of Brabant. Wenceslaus I was the first Duke of Luxembourg from 1354. He was the son of John the Blind, King of Bohemia, and Beatrice of Bourbon. Joan of Burgundy, also known as Joan the Lame, was Queen of France as the first wife of King Philip VI. Joan served as regent while her husband fought on military campaigns during the Hundred Years' War. Joan III of Burgundy, also known as Joan of France was a reigning Countess of Burgundy and Artois in 1330–1349, She was also a Duchess consort of Burgundy by marriage to Odo IV, Duke of Burgundy. She was the eldest daughter of King Philip V of France and Joan II of Burgundy. Margaret of Bavaria,, was Duchess consort of Burgundy by marriage to John the Fearless, Duke of Burgundy. She was the regent of the Burgundian Low countries during the absence of her spouse in 1404–1419 and the regent in French Burgundy during the absence of her son in 1419–1423. She became most known for her successful defense of French Burgundy against John IV, Count of Armagnac in 1419. Beatrice of Bourbon was a French noblewoman. A member of the House of Bourbon, she was by marriage Queen of Bohemia and Countess of Luxembourg.